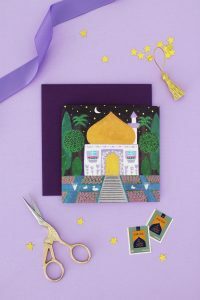 Eid Al Adha Ram Craft – Hello Holy Days! A ram is central to the story of the Eid al Adha; celebrate the holiday with this adorable ram craft using everyday materials like popsicle sticks, felt and pipe cleaners. For small children, it’s helpful to cut out the different felt parts beforehand and simply have children glue the pieces together. At the end, if you like, you can even add a string to the back for hanging. Glue popsicle sticks into a triangle. Cut a triangle from a piece of white felt the same size as the popsicle stick triangle. Glue to back of popsicle sticks. Cut out ears and a snout from white felt. Glue to front of popsicle sticks. Attach eyes to popsicle sticks. Curl pipe cleaners and hot glue or tape to the back. Did you make this craft? Share it with us @helloholydays on Instagram and Facebook!